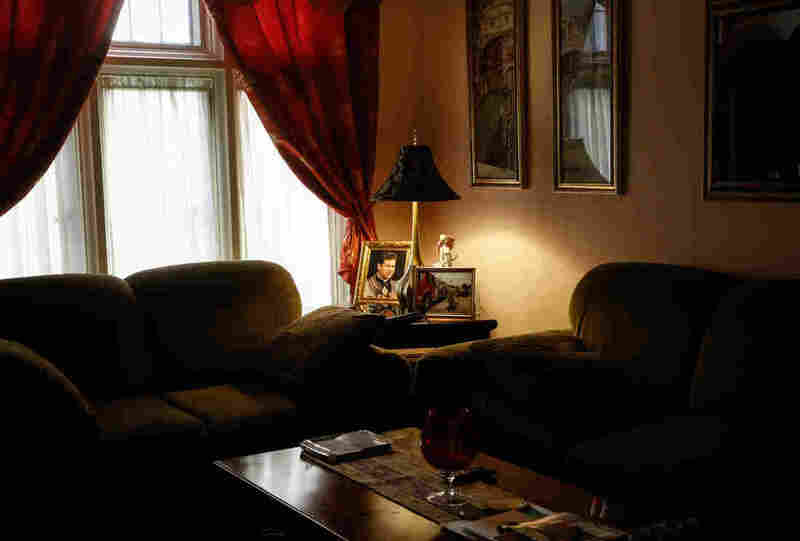 What has united all of the immigrant groups who've come to Hamtramck? Good jobs in the auto industry. Hamtramck is surrounded by Detroit, and for decades, car manufacturing was its lifeblood. Polish immigrants started coming to Hamtramck starting in the early 1900s, lured by the promise of jobs at the new Dodge Main factory. At its peak, nearly 75 percent of the city's residents were Poles. But now, after decades of decline, that has plummeted to about 10 percent, as Poles have moved up and out to the suburbs and Yemenis and Bangladeshis have replaced them. Many of those former Polish residents still flock back here each week for the Polish language Mass at St. Florian Roman Catholic Church. It's a majestic neo-Gothic structure, with beautiful stained-glass windows and an elaborate turquoise spire that rises high above Poland Street. "It's one of the kind. It's a cathedral. It just speaks to you," explains parishioner Alek Fidler — "like the one on the roof!" he jokes, "just one 'd.' "
Fidler and his wife both immigrated to Hamtramck from Poland. They met while working minimum wage factory jobs, cutting leather to make seats for cars. 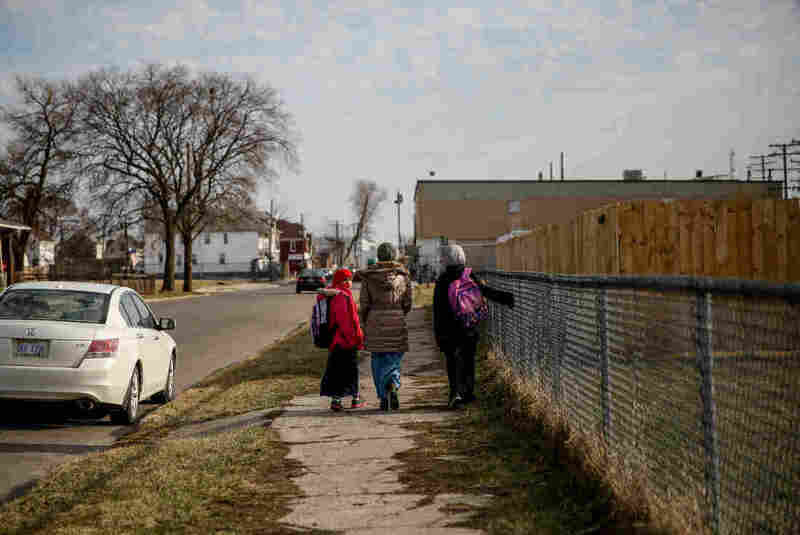 Their children were born in Hamtramck, but five years ago, the family moved to a nearby suburb, looking for better schools and a different environment. The Hamtramck they knew had changed. 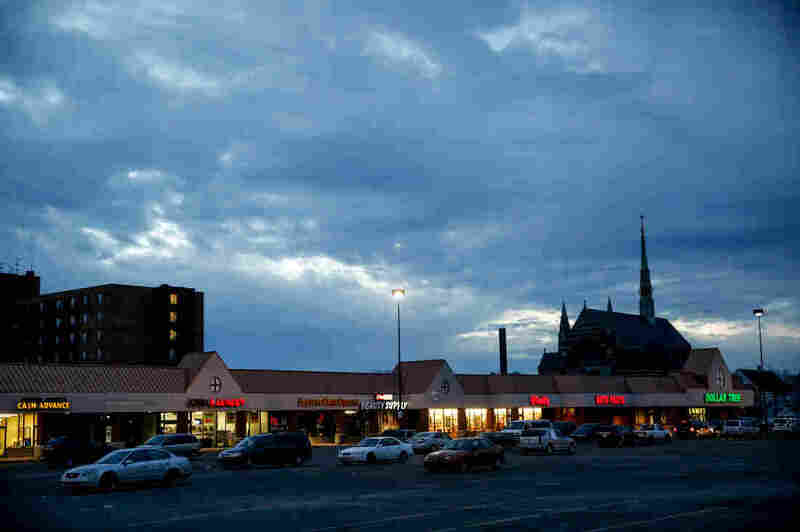 "It's now more like a Bangladeshi town, so, that's a different story," says Fidler. "Seems like, you know, they were basically taking over." That loss of identity can be uncomfortable. St. Florian's priest, Miroslaw Frankowski, recalls his first impression of this city when he arrived in Hamtramck about 10 years ago. "I'm almost like in Cairo," he says, "because you know, the call for the prayer — and people covered up under clothings typical for Middle East. Yeah, it seemed like I'm working in Middle East." In Hamtramck streets, it's common now to see women fully veiled, with only their eyes exposed. The amplified Muslim call to prayer was a source of controversy here some years back, and still can raise hackles. "It's different, nothing against it, it's just a different way. The sound, it's not from our culture," says Frankowski. 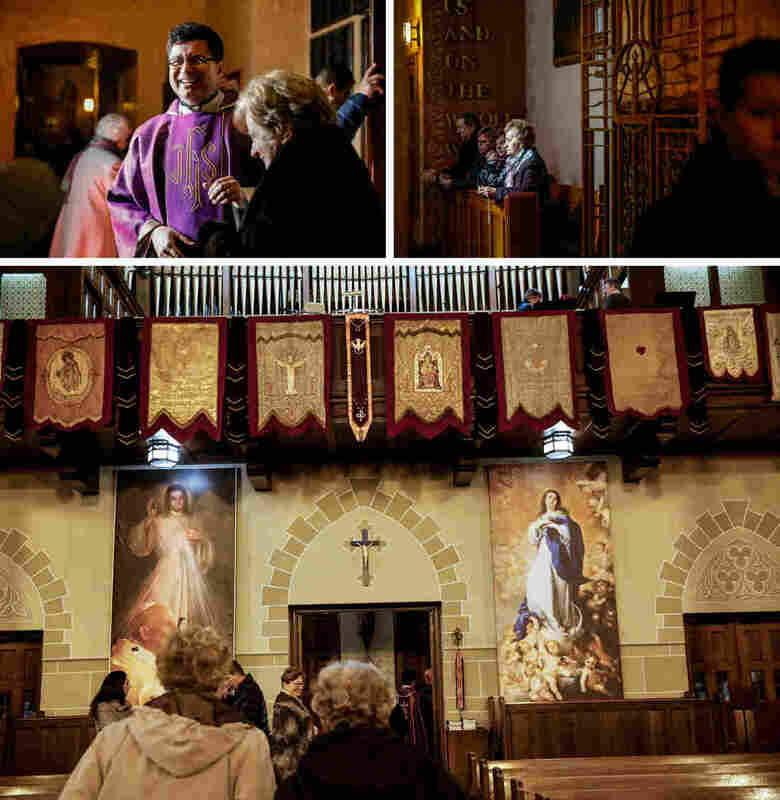 The 45-year-old priest can draw on his own experience as an outsider. He came to the U.S. from Poland when he was 14 and spoke no English when he started eighth grade. "Those eighth-graders are the worst," he recalls. "Some understood, some did not, some were laughing at me. That's why I do understand the immigrants. I know that they face difficult times. Not only because it's a totally different culture here, but because there's still love for the homeland." The Poles live side by side with Muslims, explains Father Frankowski: friendly, but mostly separate. 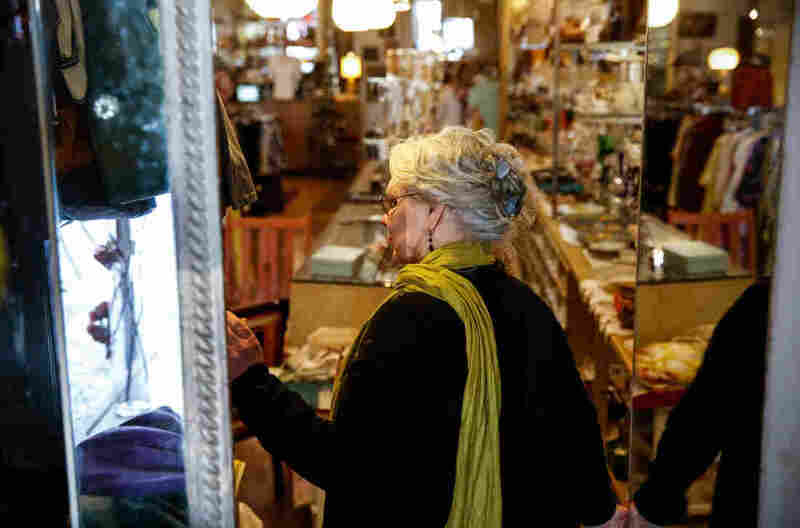 "We go to their stores, we shop at their markets," he says. He says he loves trying interesting fruits he's never seen before, and he's a big fan of hummus. (Top) In downtown Hamtramck, teenagers hang out in Pope Park, which commemorates the Polish Pope John Paul II's visit to the city in 1987. 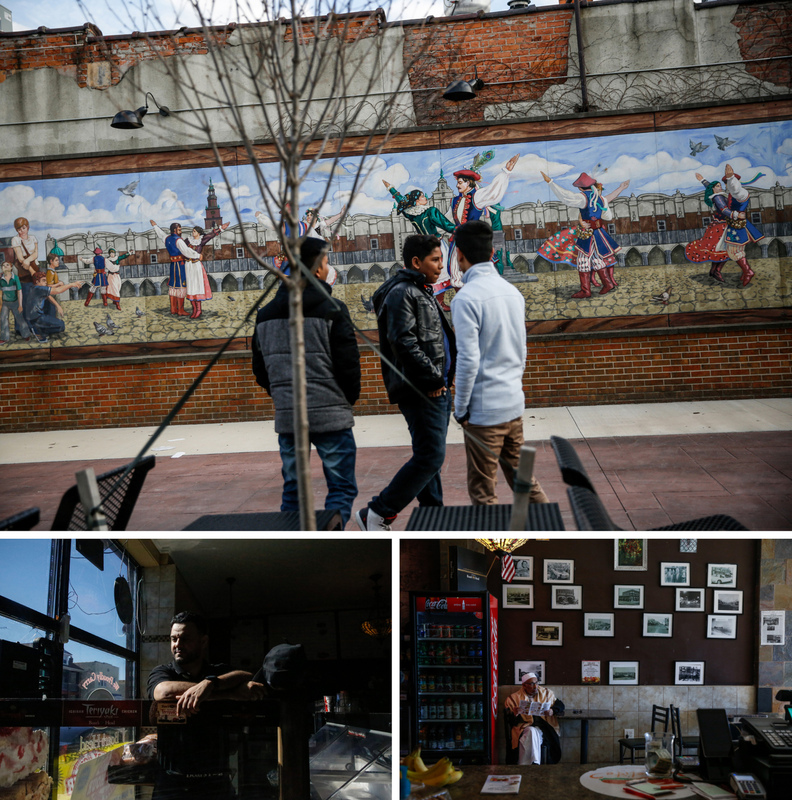 (Bottom left) Co-owner Jamal Jawany poses for a portrait at Delite Cafe and Deli. (Bottom right) Ezzi Jawany, 74, waits for his order at his son's deli, Delite Cafe. Hamtramck is now closing in on a majority Muslim population, with Bangladeshis and Yemenis making up the largest immigrant groups. There are more than a dozen mosques around the small city, one of them in a surprising spot: the former American Axle factory. The factory closed down — thousands of jobs, gone to Mexico — and the Abu-Bakr Al-Siddique Islamic Center opened up in one of the bright blue cavernous warehouses still standing there. Right across the street from that mosque, we stop in at the home of the Hadwan family. They live in a new, three-story brick house, big enough for three generations of Hadwans to live comfortably. 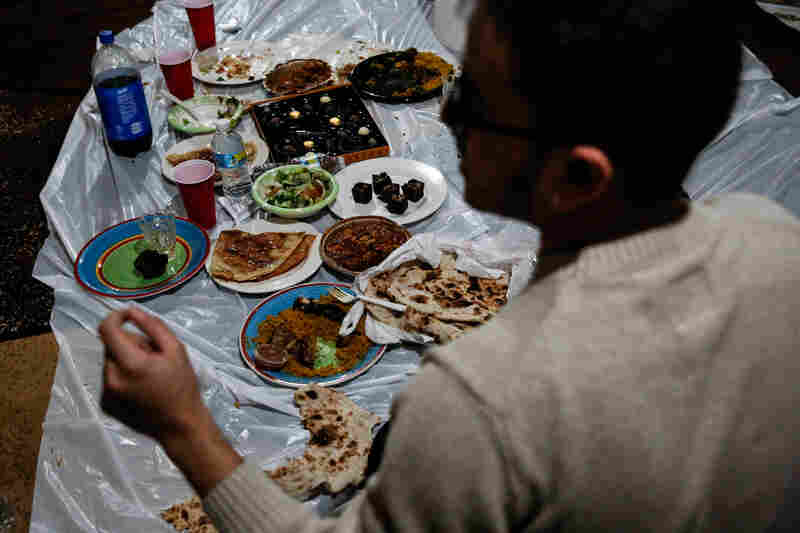 Salah Hadwan, 27, takes us inside to meet his family, and right away, his mother is brewing tea for us and his brothers get busy ordering takeout Yemeni food for lunch. "Dude, get some chicken fahsah," advises his youngest brother, Hadwan. On the refrigerator, right next to Arabic script reading "God is the greatest," there's a red, white and blue oval sticker printed with two words: "I voted." Salah Hadwan's father put that sticker there. "If he finds out one of us didn't vote, he's furious," Salah says. "You guys would not believe how proud they are to have the rights, and how hard they worked to get it. My dad wakes us up as soon as the polls open. And if you're not at home, he'll call you all day." Soon, we gather — sitting cross-legged on the carpet — to talk over plates of chicken stew, roasted lamb and wedges of sweet, flaky bread. Salah, who goes by Sal, has invited two Yemeni friends over to join the conversation: Nabil Nagi, 32, and Yunus Wasel, 33. All of them are the sons of proud autoworkers. Their fathers or grandfathers spent decades working the assembly lines for the Big Three. "You didn't have to have much English," explains Wasel. "You're on the assembly line. No one's gonna pick on you, and it was a good paying job at the time." All three agree that their fathers were hard workers: "If they weren't," says Wasel, "they would never have stuck in there for 35 years." 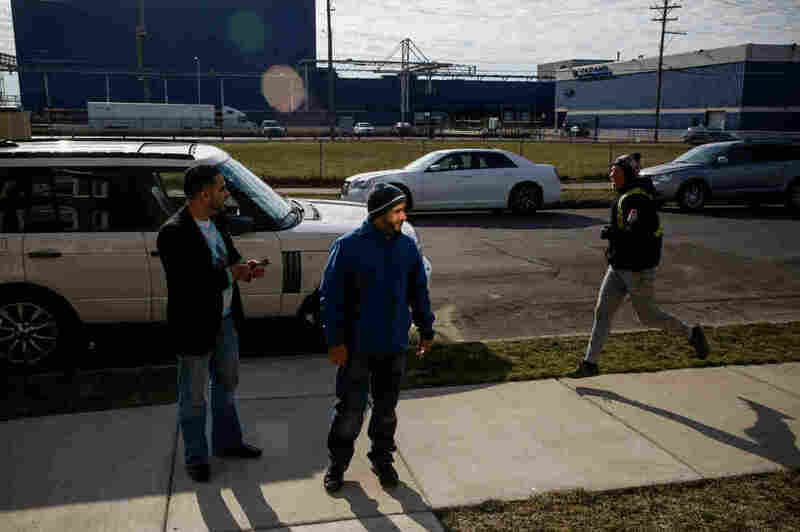 Here's a signpost of just how shared the immigrant experiences can be in a place like Hamtramck: it turns out that Salah Hadwan's father cut leather for car seats in the very same factory as Alek Fidler, the Polish parishioner we met earlier at St. Florian. And just as we heard Father Frankowski profess his fondness for hummus, these young Yemeni men excitedly describe their love of a Polish delicacy: custard-filled paczki, the doughnuts that are a famous Hamtramck tradition. Food is, as always, the great uniter. 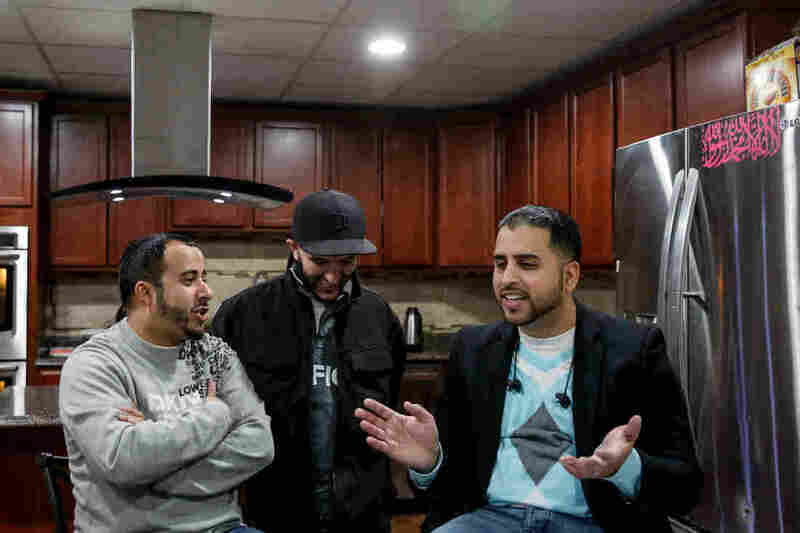 As we talk in the Hadwans' home, our conversation turns to the sharp, anti-Muslim rhetoric that has erupted around the country and the Trump administration's travel ban, which specifically targets Yemen. Salah and his friends are all U.S. citizens, so the travel ban on Yemenis shouldn't affect them directly. But it still stings, they say, and creates fear. "You're banning us as Yemeni and also sending us drones to kill us every day!" exclaims Wasel. "If they wanted to ban a country, why didn't they ban Saudi Arabia?" "But you guys, we all knew," chimes in Salah Hadwan, the "countries that were banned never had a terrorist act committed from any of those." They all start talking at once: "a traditional Yemeni way of communicating," Hadwan tells us with a smile. Hadwan is a registered nurse, working in the intensive care unit of a nearby hospital. He tells us about a patient he took care of who mistakenly thought "Sal" on his nametag meant that he was a fellow Italian. Assuming he had found a sympathetic ear, the patient started bashing Muslims, saying that Arabs are all terrorists and should all be deported; that Islam would doom the world. Salah held his tongue until it was time for the patient to be discharged. Only then did he tell him that he is Muslim. "There's times where you just gotta be the better person and the bigger person," says Hadwan. "Being of Middle Eastern descent, we have to be stronger and learn how to control our emotions." "It hurts," says Nabil Nagi. "When I heard all that [anti-Muslim] stuff, I look out the window, I see the [American] flag, and it feels like home. But at the same time, it was hard. It was like betrayal in a way." "But you should know," Salah Hadwan says, looking at Nagi, "as an individual ... It shouldn't have bothered you and hurt, because we know who we are." Yunus Wasel jumps into the conversation: "OK, we're all proud Americans. From Day 1 to right now. We came from Yemen, we're living in America. We're Yemeni-Americans, we're proud Americans. But to get hit with what's going on right now, it takes something out of you and you're angry. Who is not angry? Who is not mad? At the same notion, it's not like we're going out here doing anything violent or getting mad about it. We protested and that's it. But we're still mad at why we got the finger pointed at us." "At the end of the day, Trump won, this is what it is. And now we've got to work together and show what it is to be an American." Hadwan suggests that their diverse city should serve as a model. He says, "I wish there was a mini-Hamtramck in every state."